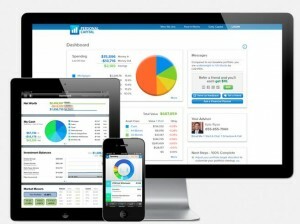 Personal Capital is a one-stop shop for aggregating all your financial information in one spot in an automated fashion. The beauty of the system is that once you connect all your financial institutions from banks to IRA, 401(k) accounts and more, your Personal Capital dashboard will aggregate everything in various views and can be customized to send you alerts when various thresholds are reached (i.e. too heavy in one particular asset class, etc.). This is a nice “auto-pilot” tool which should hopefully cut down on manual management of your investments, as well as alert you to conditions you may not have been tracking otherwise. Some of these custom alerts and deeper analysis is what Mint and other personal finance software misses. Personally, each month, I get kind of excited (I admit it) to manually go through and log in to all my different financial accounts and enter my net worth into a spreadsheet. I have the history plotted in a chart and I derive some satisfaction from seeing my overall net worth increase (most months). Well, using Personal Capital should cut down on all that aggregation I do manually, plus allow me to see at any time where I stand. This is especially nice when there’s the occasional flash crash or mid-month when I’m weeks away from my latest update. Stock Options – I currently have to track my company-issued stock options separately, but this tool aggregates it in. This is a nice feature since in reality, these grants should count as part of my net worth, but it’s a bit of a hassle to track them in a spreadsheet or through the company-sponsored site since it’s different than my 401(k) login which is where I spend most of my time. Fee Analyzer – Who even knows what the fees are on their mutual funds? In my 401(k) plan, I have to click on each fund individually and search around in the “fund details” page, whereas here, it rolls it all up for you. Investment Goal Analyzer – Again, this is something I do manually that now Personal Capital can do for you. Asset Over/Under-Weight Warnings – Over just a few short months, you could see certain asset classes go way out of whack with your investment objectives. We could certainly see this come election season and the impending fiscal cliff. So, a valuable prompt for rebalancing. This looks awesome on the iPad and iPhone; as well. They’ve done a really nice job with both the interface and the display. The Best Part? It’s entirely free! Of course, you’re probably wondering how anything of value is free. Well, they employ the traditional freemium model. See, by entertaining only accounts with at least $100,000 in assets and assuming at least a small portion of all customers will eventually employ their Financial Services, they anticipate a return on that investment. Personal Capital is headed up by Bill Harris who is the former CEO of Paypal, Intuit and holds numerous accolades, so the organization certainly has the leadership and vision to continue to innovate. Additionally, the firm has had some nice press of late – especially after being named one of Time’s 50 Best Websites, being featured in BusinessWeek, CNBC and more. So, if you have a few minutes on your hands and want to save yourself time down the road with the benefit of all the tools, reports, alerts and account aggregation, Sign Up Here for Personal Capital. What do you have to lose, it’s free!